Purchasing a custom high-end suit can be difficult territory to navigate, especially for first-time buyers. Top-tier custom clothing provides unparalleled style, fit, and quality, but it also requires an investment of time, money, and consideration. For many men, the fast and easy allure of inexpensive suits is understandable—especially when there are so many suit makers and sellers who claim their goods will pass for those from more expensive labels. Who doesn’t want more for less? However, cheap suits tend to be just that: cheap. Cheap in terms of details, cheap in terms of craftsmanship, and cheap in terms of durability. Instead of opting for that route, view a high-quality suit as an investment, a product you’ll use and glean value from for years to come. Think of recent major purchases you’ve made. You probably understand intuitively that the latest iPhone and a cheap, basic cell phone each provide vastly different levels of quality and user satisfaction; you can expect the high-end smartphone to have a more powerful camera, more storage space, and more processing power than the cheaper alternative. Suits are much the same: A budget suit and a high-end suit will both get the basic job done—but the high-end suit is the one that comes with lasting advantages. Nothing is as important to the look of a suit than the fit. A well-fitting suit accentuates and flatters your form, making you look powerful and confident. The tailoring of a high-end suit custom-made just for you from a pattern designed from your measurements sends a message of precision about the clothing and the person wearing it. The fit of a suit bought off the rack—or even one ordered from a made-to-measure clothier, in which your suit is assembled together from either precut pieces or pieces cut from a stock pattern that more or less fits your measurements—can’t compare. For the most meticulous and exacting fit, settle for nothing less than a high-end garment designed for no one but you. 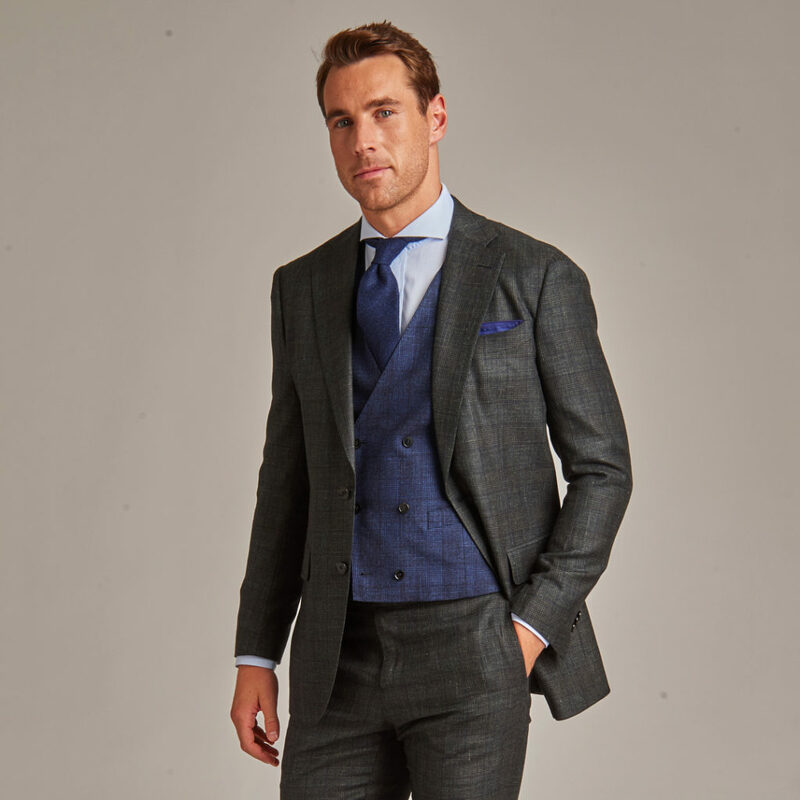 Apart from giving you the chance to choose your own fabrics, high-end custom clothing offers you multiple avenues of control over the final look of your suit. What kind of cuffs do you prefer? Should your collar be open or pointed? Do you want notch, peak, or shawl lapels? 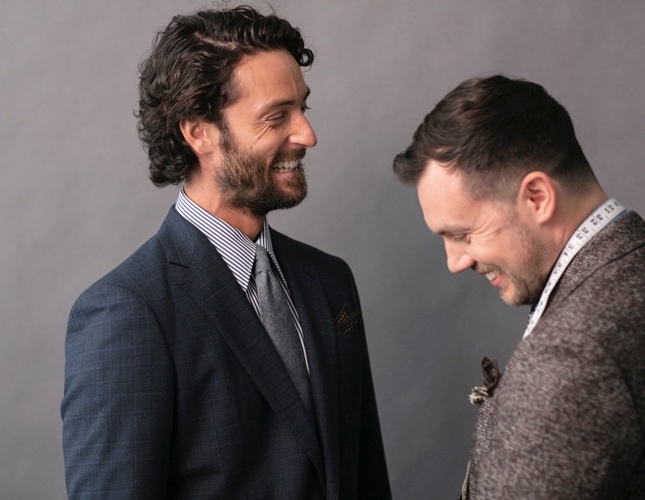 If the phrase “notch, peak, or shawl lapels” sounds like a foreign language to your ears, there’s no need to feel overwhelmed: A high-end custom clothier will supply you with a tailor or a knowledgeable personal stylist who can guide you through your selection of fabric, cut, and customization and help you decide what’s most appropriate for your garment—and what will work best for you. Your stylist can also give you helpful advice about the latest fashion trends and can collaborate with you on a suit that will present the best possible version of yourself to the world. The highest-quality fabrics are the beating heart of upscale custom suiting. Even if a cheap suit looks good on the rack, the fabric is likely to reveal the overall lack of quality. Fabrics that are cheaply manufactured will stretch, shred, tear, shrink, lose their shape, and fade as time marches forward. When you invest in a high-end suit, you invest in fabrics supplied by the world’s best mills, woven with skill and care from high-grade yarns. Your high-end custom suit will also be stitched together with care and precision, which means your garment will last a long time and retain the same perfect fit and shape as the day you brought it home. Spending a thousand dollars or more on a single suit can represent a significant expenditure—but it will last you for years. The suit you bought for three or four hundred dollars, on the other hand, will most likely need to be replaced every year. In the long run, the higher upfront cost will reap dividends. You may find both personal and social value in indulging in high-end clothing. A custom suit sends a message to everyone who sees it—bosses, coworkers, friends, and significant others—that you care about quality and take pride in your appearance. It lets everyone know you see yourself as a worthwhile investment. In other words, wearing custom clothing is a measure of how you define yourself. The rest of the world will draw its opinion about you largely from the message you send. 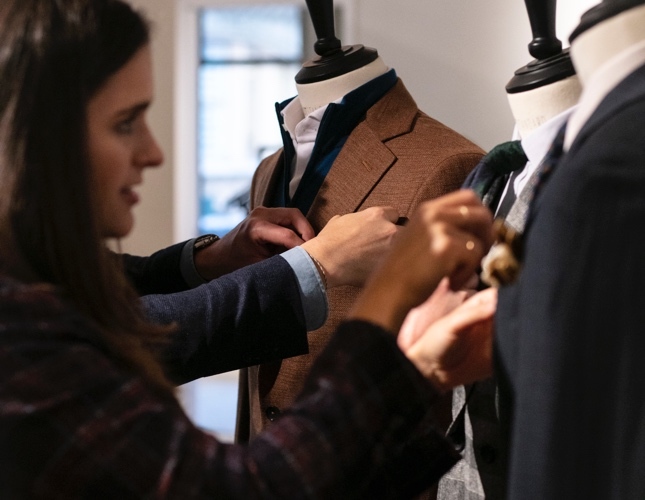 When you make an appointment at a Knot Standard showroom, you’ll meet with a skilled and experienced personal stylist who’ll consult with you about your needs and personal tastes before measuring you for a custom pattern made solely for you. You’ll have your choice of thousands of fabrics from globally-renowned mills, such as Zegna and Loro Piana. 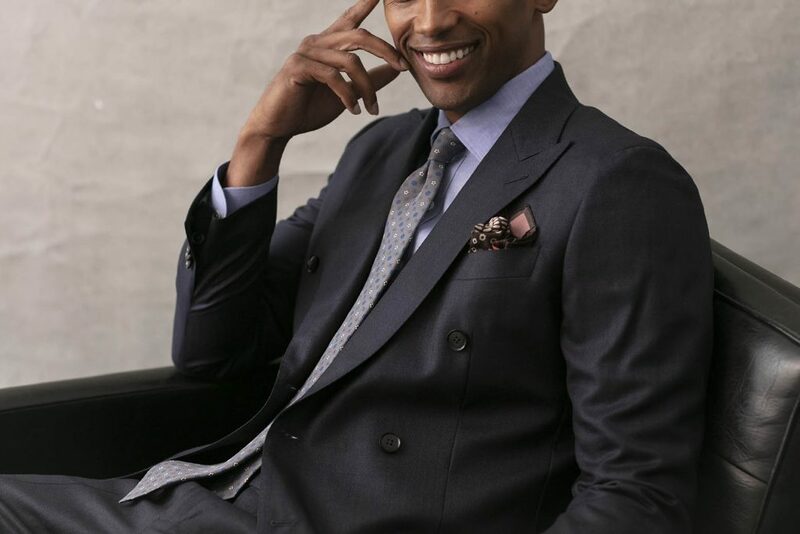 While high-end suits require more from you in terms of time, effort, and money than a cheaply-made counterpart, they’ll pay back that investment with interest in quality, style, customization, and longevity.